Finding the essential information you need to know in order to wisely purchase a women’s wedding ring, particularly a gold women’s wedding ring, is not easy. To start, what makes womens wedding rings actually a woman’s ring? Should the ring be white, or yellow gold, and either 14 karat or 18 karat? Plus, what about where the gold comes from? No one would want to wear a gold wedding band made from gold that funded conflict, or polluted a village’s river or entire watersheds with mercury. Here, you’ll learn the real story. This article is perhaps the most comprehensive information on choosing a gold womens wedding ring you’ll find online. We’ll cover issues you probably have not even considered, including insider information on ethics and values that many jewelers would never reveal. When you’re done reading, you’ll know the issues that will empower you to choose a women’s wedding band that matches your real needs. We’ll start with the most basic question first: gender. This wedding ring is handmade in our studio, here in Santa Fe. 1. What Makes a Women’s Wedding Ring A Women’s Wedding Ring? Here’s what you need to know: just about every decision in choosing a womens wedding band is subjective. The simple answer is, if a woman chooses to wear a wedding ring, then it is a womens wedding ring. It is not about money or even what precious metal you choose. It’s not about expense; it’s about meaning, today as it always has been. Six thousand years ago, the first wedding rings exchanged by couples in Egypt, were made of braided hemp. Egyptologists report than when things got bad along the Nile, such as frogs falling from the sky or nasty spousal arguments, married couples would cut their rings, smoke them and mellow out. These days, couples have other options for dealing with stress, and wedding rings are now made from a variety of metals and styles, not just braided hemp leaves. Primarily, creating a collection of mens wedding rings and wedding rings for women are based upon two issues: width and style. Gold womens wedding bands are generally going to be narrower than a man’s ring. As women generally have smaller hands, it follows that they would have narrower widths. Generally, womens wedding rings range between 2mm and 6mm. This is not an absolute rule of course, but rather what I’ve noticed selling women’s rings for the past twenty plus years. Apart from hand size and comfort, perhaps the most important consideration in context to the width of a womens wedding band is the engagement ring. This gold bridal ring set was designed Katherine Aberle. If you’re going to wear a wedding ring and engagement ring at the same time, it is important to consider, from the beginning, how they will look together. Are they going to be wide? Will the wedding ring easily spin around next to the engagement ring? Generally speaking, with most bridal ring sets, the two rings combined are preferably under a width of 8mm. Wedding rings are both intensely personal and public. Inwardly, they represent a ceremonial vow to oneself and one’s partner. Yet for many, couples wedding rings are also covenants within a broader community of family and friends. 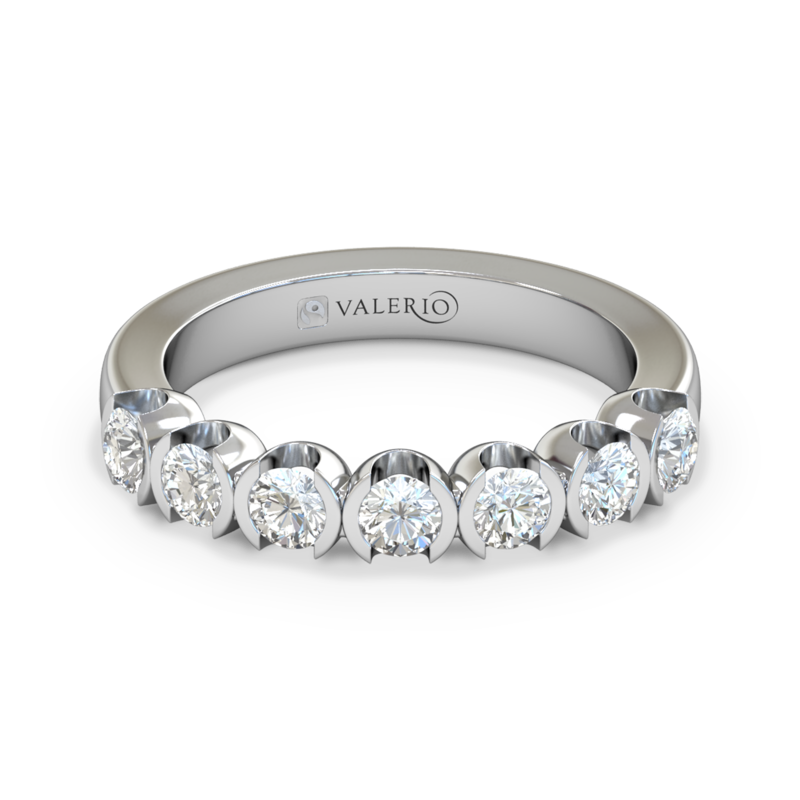 There are an infinite number of womens wedding rings styles, but we can break these into two broad classifications: classic and designer. Comfort fit rings are classic, simple, elegant and a clearly traditional style of wedding rings. For some women, the choice for a wedding ring is simple: a classic band. There’s a good chance that your parent wore this timeless style that are always loved for their timeless simplicity. 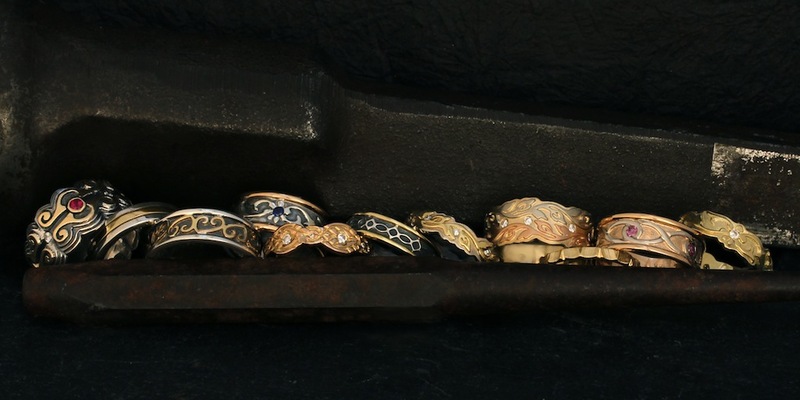 Yet, even in the traditional women’s wedding ring style range, there are many possible options. The surface of your wedding ring can be flat topped or dome topped. Widths can vary. The edges on the top surface of the ring can be rounded or squared off. 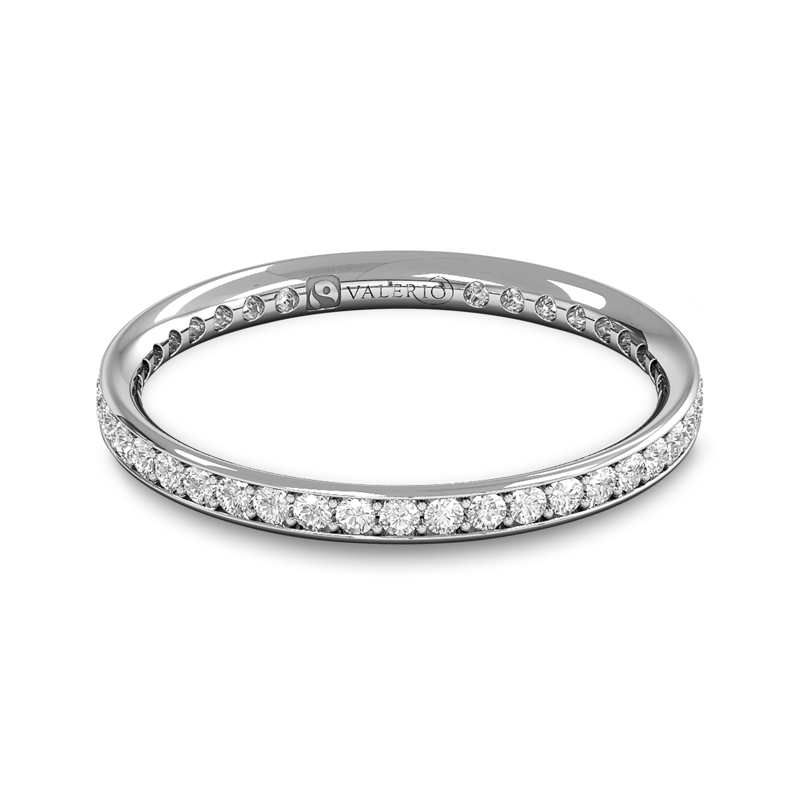 Also, you can consider variations of the classic womens wedding band style by adding grooves along the edges that add a bit of designer element. 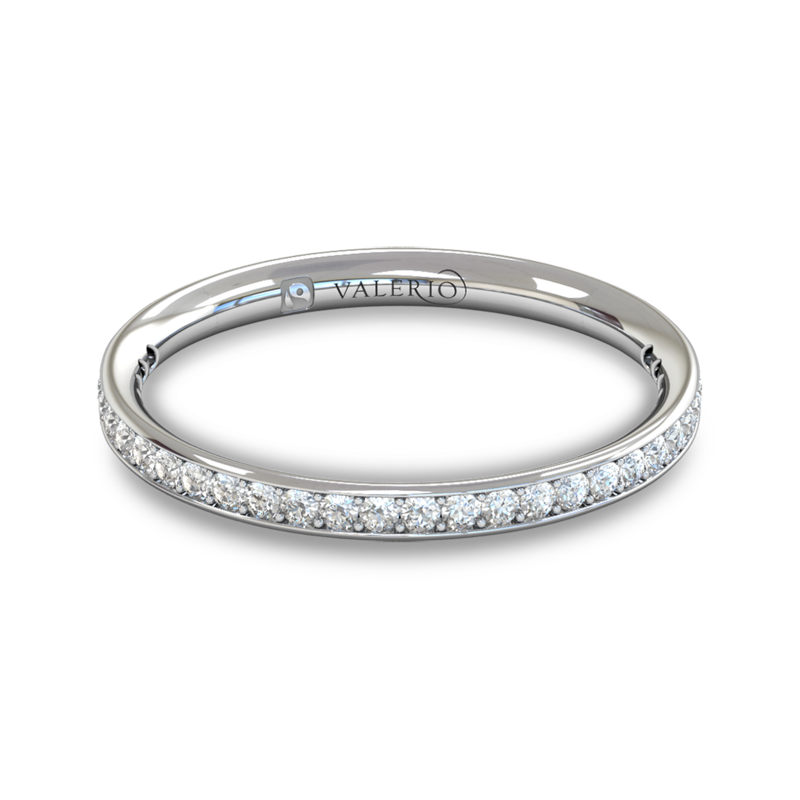 No matter what classic womens wedding ring style you choose, it will be a powerful yet understated symbol of your commitment to you and your partner. Moving beyond the traditional or classic wedding band category toward the designer classification opens infinite possibilities. The surface of a womens wedding band is actually a canvas upon which a jeweler can create a design. The actual style of the wedding ring you choose can symbolize a particular quality or talismanic symbol. As for what the design is, your imagination is the only limit. But, to help get you started, we have some suggestions for you. Perhaps you and your beloved stare into the night sky and wonder, what is beyond the beyond and where am I? You are entranced by the mystery of the stars and sky. 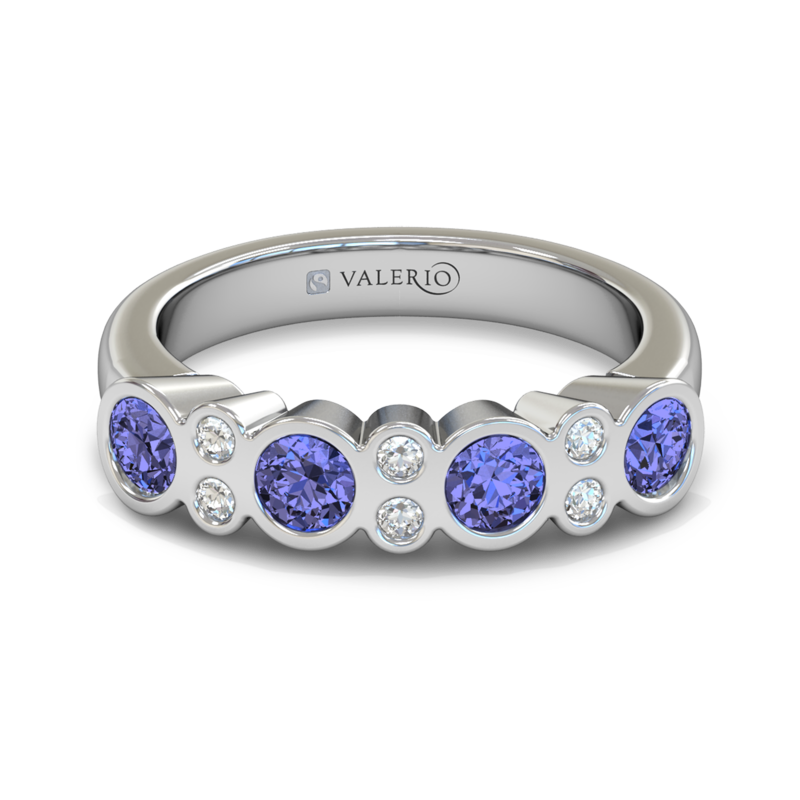 The wedding ring inspired by Van Gogh’s starry night, might be the perfect choice. Another idea: a womens wedding ring can also represent the nature of the partnership while simultaneously expressing cultural connections. 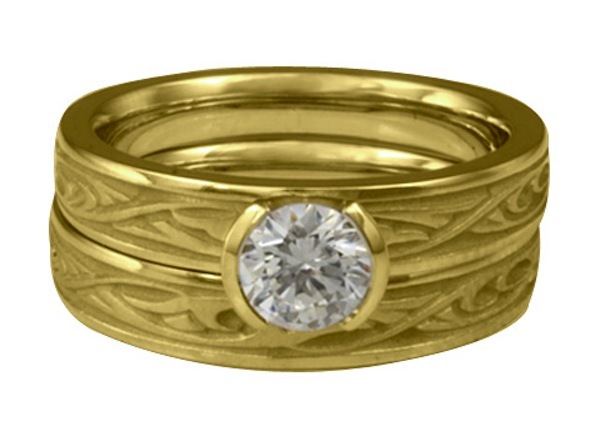 With the Celtic arches wedding ring, the lines represent two paths that are woven together. The individual strands of the knots, in unity, arch up from earth to the heavens and then back down again in an endless wave of creativity, delight and (hopefully) harmony. Another option: you and your love enjoy a good frolic…along the seaside. Then, dive into this ocean of love symbolized by the wind and waves design. 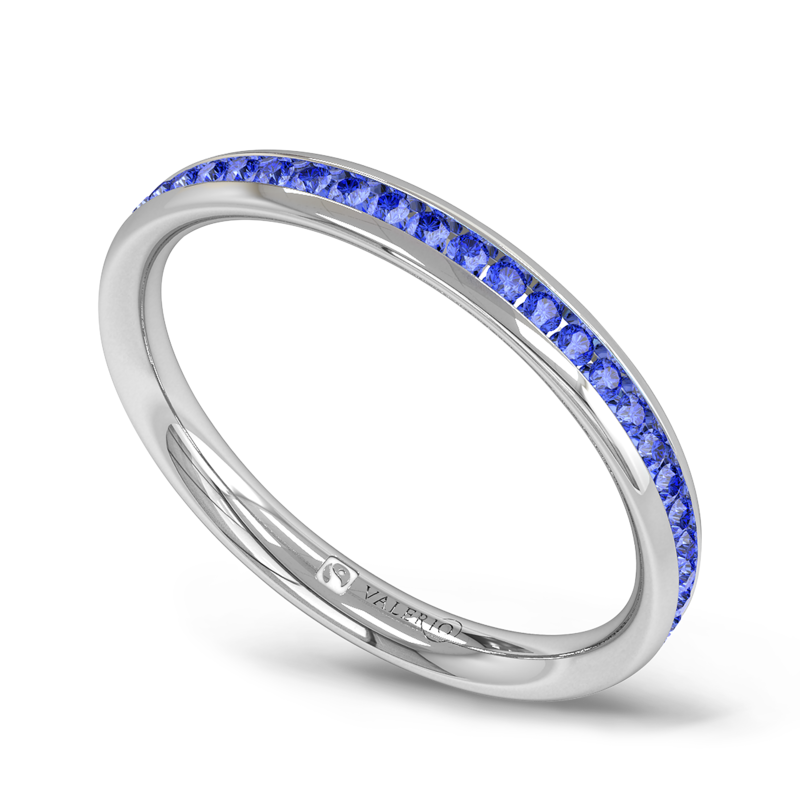 You can also think about what images or designs you want and create a custom wedding ring. Rubies and diamonds adorn this designer wedding ring design. The choice comes down to what is most important to you among a number of different factors, from style to width. There are no fixed or hard rules. For example, one of our most popular designs is the Medieval Ring, shown above, which is 11.5mm wide, inspired by curling motifs carved in stone in central Europe. Some couples do not have matching wedding bands while others do. Again, what actually matters most is what feels best to both of you. But if you do want to match, another way of doing so is with the color of the gold you choose. 8. What Is The Best Gold For Wedding Rings For Women? We’ll start with the basics: 14 or 18 Karat or Caret? The word caret originated with the ancient Greeks and is actually related to carob seeds, which are comparatively uniform in weight. “Caret” is a weight of measurement used for precious stones, while “karat” is a variation of the term caret and refers to the percentage of gold. Twenty-four “K” gold is pure (.999%) gold. A 14K ring is .585% gold and an 18K ring .75% gold. The balance is alloy, which we will discuss in point 10 below. Understanding these issues are important when considering womens wedding rings. Here’s a bit of inside information as to why. Most jewelers will always recommend 18K womens wedding rings because the 18K gold ring is more profitable for them. You’ll see, after reading this section, why sometimes a 14K womens wedding band is our recommended choice, particularly in the case for white gold wedding rings. This illustration shows that the 18K ring, on the left, is more golden. Here’s the real deal. Whether you should choose 18K or 14K depends upon personal preference, budget, the color of the gold and somewhat of your lifestyle. The advantage of an 18K yellow gold womens wedding ring is that it is more gold in color. In other words, an 18K yellow gold has an illustrious warmth and radiant beauty because it is 75% more gold than a 14K ring. 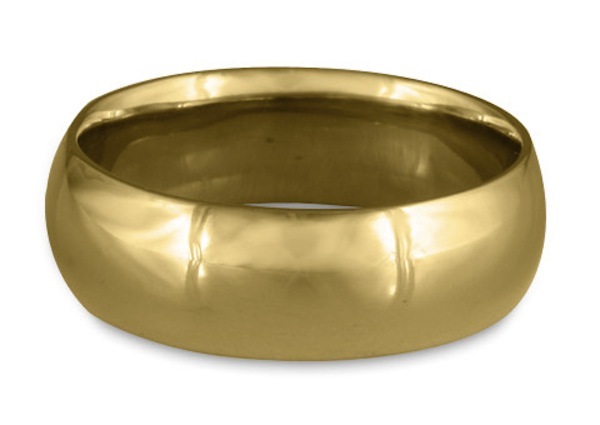 If you’re drawn to the color of gold, then it makes sense to have a ring with more gold content. 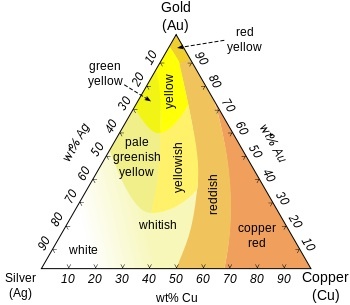 This alloy chart from Wikipedia shows some of the materials used to color gold. A 14K gold wedding ring has less gold in it than an 18K gold wedding ring, that is true, but that actually turns out to be an advantage if you wanted a rose or white gold wedding ring. More alloy means less gold color and more room for a more intense rose or white color. Two other advantages of 14K gold wedding rings for women over 18K gold wedding rings: more alloy content means that the gold wedding ring will be more durable and less expensive. In other words, an 18K gold ring is softer than a 14K gold wedding ring because alloys are what makes the metal harder. In context to rose gold wedding rings, the choice between a 14K and 18K womens rings is a matter of preference. The main alloy is copper. A 14K gold ring will have more of a copper tone, while an 18K rose gold wedding band will have more of a “goldish” copper tone. Here’s another insider tip: with white gold wedding rings, the best choice is a 14K wedding ring. 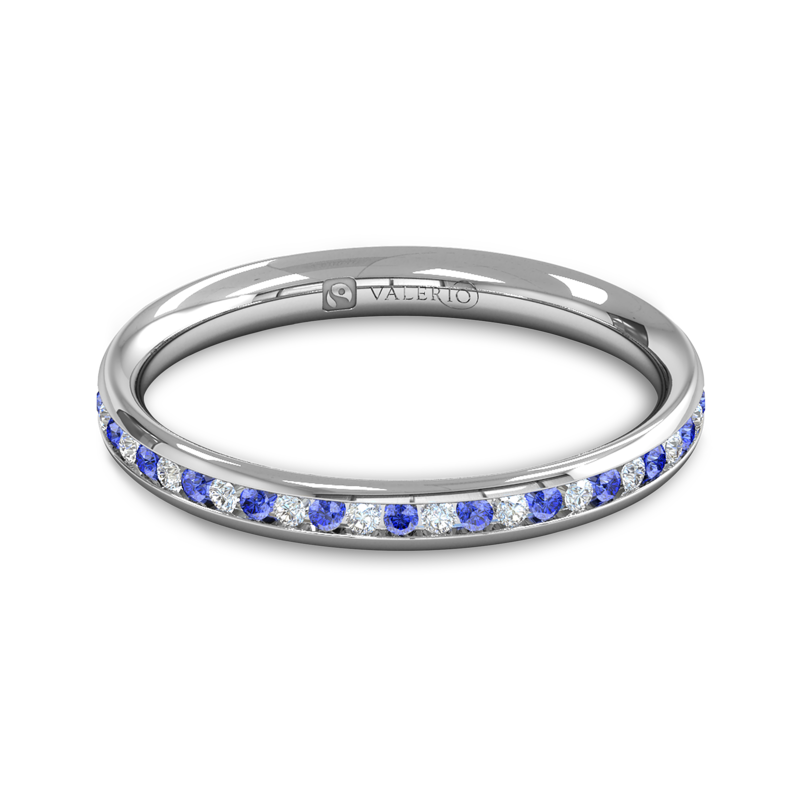 It is less expensive and has more white color than 18K white gold wedding rings. There are issues with white gold wedding bands, however, that need to be considered in more detail. How white does your white gold wedding ring need to be is something of great concern to jewelers. A yellowness index as measured by a color spectrophotometer was developed by Gretag Munsel to answer just this question, shown above. The whitest metals are naturally white metals, such as platinum. As the chart shows, white gold has a relatively broad range of white, from a snowy white to a beige. White metal womens wedding rings are extremely popular, perhaps in part because they are a less expensive white metal than platinum. Before the recent popularity of palladium wedding rings, white gold was really the only white metal alternative. To make white gold wedding rings look like platinum wedding rings, jewelers came up with rhodium plating. That way, they can sell you a more costly 18K white gold wedding ring by making it look like platinum. Rhodium is a natural white metal in the platinum family and even today plating remains popular among jewelers but it is also controversial, as you’ll see in the opinions in this this article I posted several years back. The problem, undoubtedly a bonus in most jewelers’ eyes, with plating, is that it will wear off after only a few short years. So, you’ll have to go back to your jeweler. You probably do not want to fix your wedding ring periodically like a car or a lawnmower. 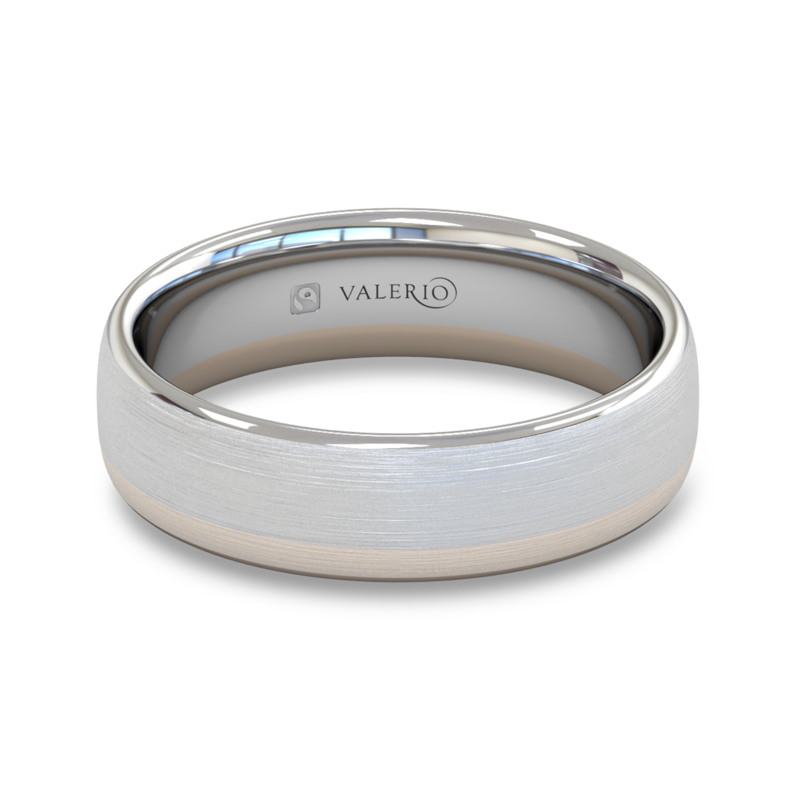 We believe a wedding ring should be hassle free. But the question is; will your white gold wedding ring be “white enough”? In fifteen years of selling white gold wedding bands online and in our store, both in 14K and 18K, we have never had a ring returned because it was not “white enough”. 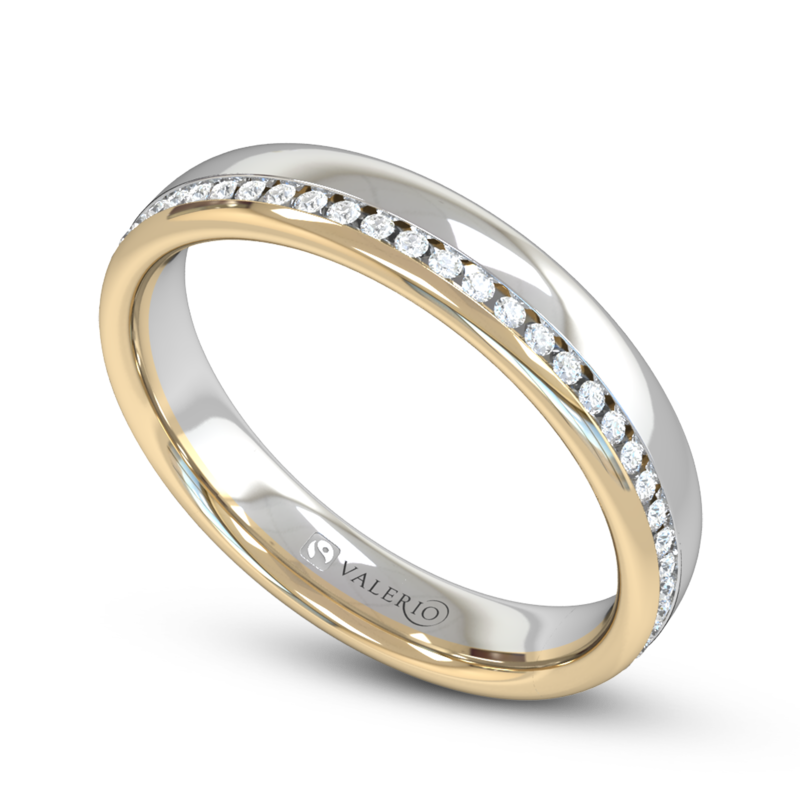 Therefore, we always recommend white gold wedding rings with made of 14K gold over 18K. If you are highly considering white gold, however, take a look at this article which compares white metal used in wedding rings. Many jewelers will not even raise this subject, but we feel it is important to consider how a ring is made. There are two options: rings are either mass produced through machinery, or studio made by artisans, and we will cover both briefly. If you go into a big box or chain jewelry store, it is likely that you’ll see highly mass produced women’s wedding rings that are machine made. Most jewelry, not including ours, today is made through CADCAM processes through which a ring is drawn up on a computer screen, emailed to a modeling machine and reproduced through mass casting processes. The secondary method, common particularly with plain wedding bands, is die striking. One piece of steel strikes metal into a form with 50 tones of pressure to create wedding rings. Except for the material, these soullessly efficient manufacturing processes are not a lot different from how someone might create plastic cups, car parts or cheap pots and pans. Obviously, you can see my bias. But, alas! All is well, because you have a choice. Our Lead Designer, Helen, making a two toned wedding ring. There is a special alchemy that takes place between an artist, the gold and the pure blue flame. The love of craft is infused into the ring itself, which becomes a kind of…remarkable offering. 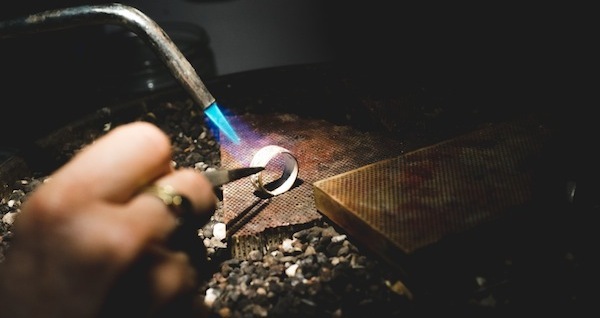 Your ring can be made by someone who has dedicated their lifetime to achieve a level of mastery in their trade. 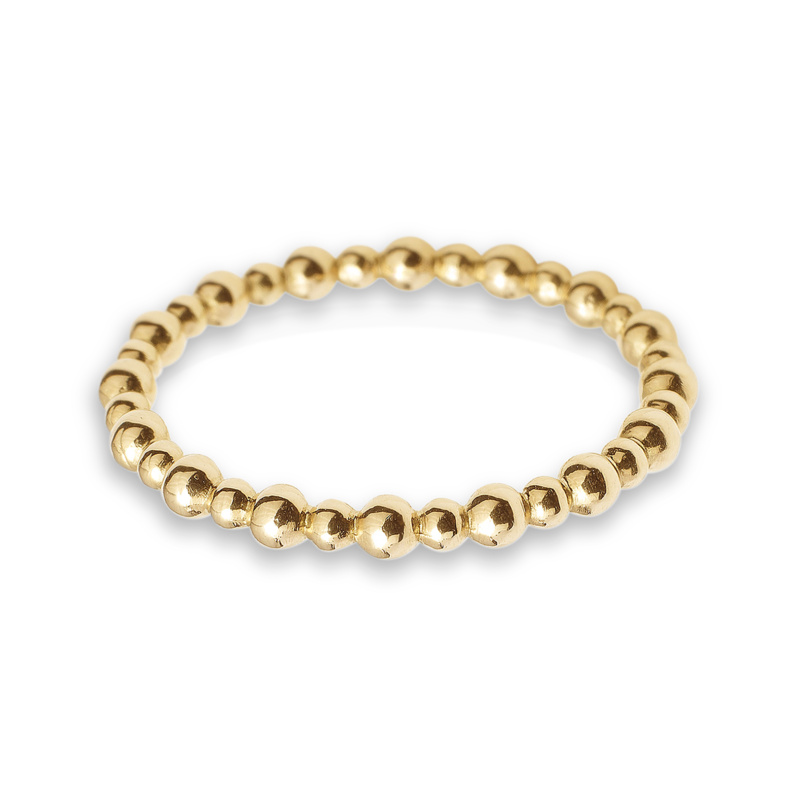 For example, this Arroyo Luminoso wedding ring was created by Michelangelo Stanchi, a jeweler from a multigenerational line of jewelers from Italy, carves his rings from wax. From the wax, a mold is then created to cast his rings. From there, the stones are handset and the ring is polished to sheer perfection. Besides wax carving, some jewelers, such as those at my company, work primarily with sheet metal and wire as design elements to hand make wedding rings. We are part of a long line of a Southwestern jewelry tradition that has literally been passed down from the Spanish Conquistadors who settled in our area over five hundred years ago. 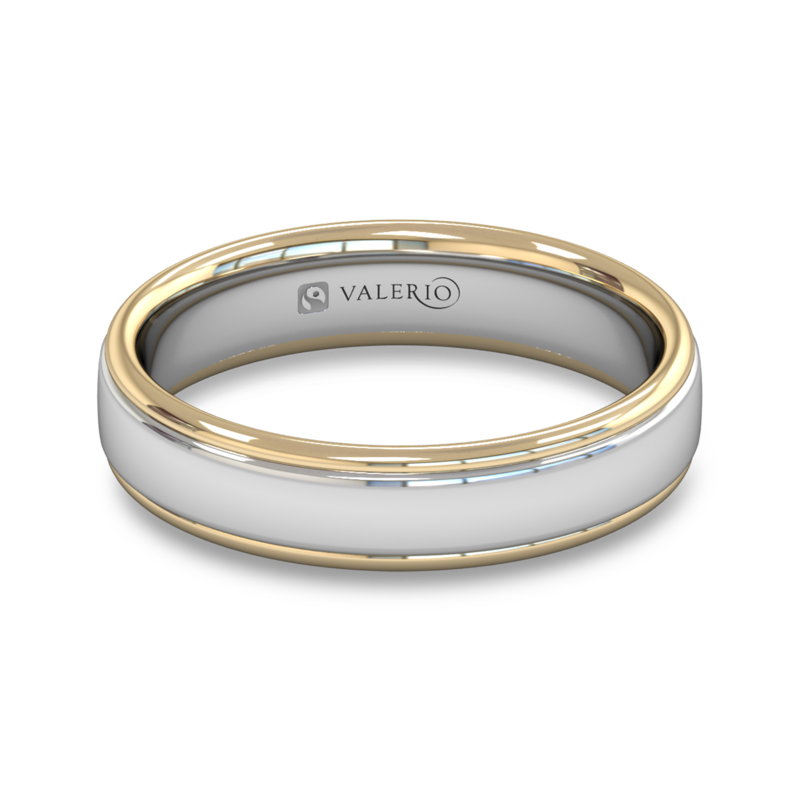 Our beautiful two tone wedding rings hand made with fused sheets of yellow and white gold are extremely difficult to create. Metal is shaped, formed and soldered together seamlessly by jewelers who have spent decades mastering their craft. I also want to mention that handmade wedding rings need not be too expensive. 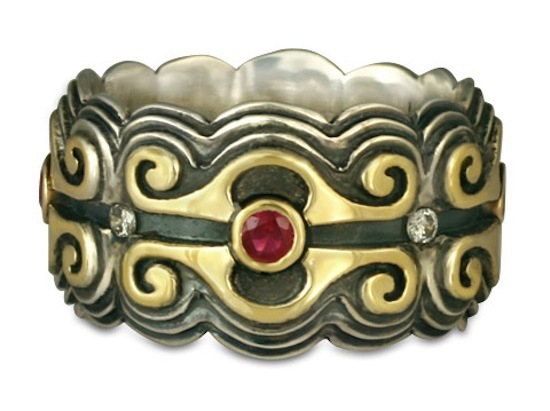 This gold over silver flores design is a lovely womens wedding ring for $425. But where does the gold in these rings come from? This question brings us to our final, and in many regards, one of the most important considerations. 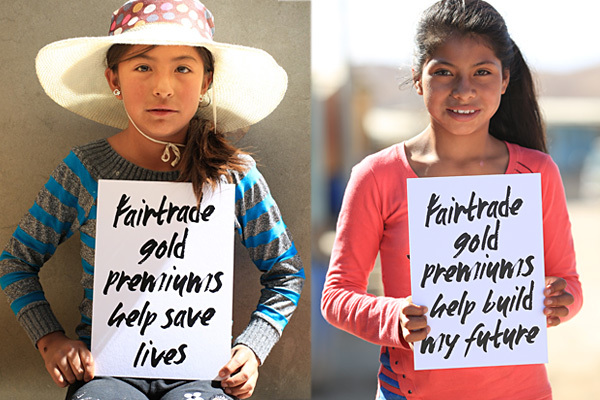 These young girls are the daughters of Peruvian miners who have converted their gold mine to the Fairtrade standards. With dirty gold and blood diamonds in the news over the past decade, jewelers have rushed to become more ethical in their practices. One of the main changes we are seeing is the use 100% recycled gold. Without question, using 100% recycled gold to make wedding rings is better than utilizing gold from massive industrial mining operations. Yet, creating wedding rings out of recycled gold does not reduce child slave labor, the ruining of ecosystems, or the heavy use of mercury associated with gold mining. Instead, it merely avoids these issues. What you need to know now is that there are two types of gold mining: large-scale mines, which are about the politics of greed and small-scale mines, which are about the politics of bread. Small-scale artisan miners produce about 15% of the total world’s gold supply. Yet these miners are 90% of the worlds gold mining labor and their lives are characterized by exploitation and poverty. They mine to survive. You can support an international movement to improve the lives of these miners when you have your wedding ring made with Fairtrade gold. It is the best chance these miners have to work their way into a much better life through safe and responsible mining processes. Best of all, the entire system, from miners to jewelers, is independently audited through Fairtrade gold certification, a set of benchmarks created by Fairtrade International. So, if you really want the symbolic meaning of your ring to match the sourcing of your wedding ring, then there is only one choice: have your wedding ring handmade with Fairtrade gold. Great article! I've been feeling overwhelmed every time I begin to look into purchasing wedding rings. This was super helpful I now feel confident to begin the process. So glad it could help! We hope your wedding ring journey has been smooth. Let us know if you have further questions if you're still on the hunt. Very interesting article. I didn't know there was so much to know about a woman's wedding ring! Great article. I'll definitely consider your websight when I'm ready to buy my wedding rings. If you haven't found anything yet, give us a call. We can help with the hunt! I always wondered what Fine Jewelry meant, and now I know. Thanks. So many good points to consider! I had been thinking about using my Grandmother's ring as a base for a new commitment ring, but that gold was mined questionably, years ago of course. When I sit and hold that ring, and feel the energy of all that came before, I realize I want something new and fresh for my own new relationship. If it is possible to sell that gold ring, and put it towards a new, Fair Trade gold ring, that might be my best option. Thanks for all the good info! We buy gold all the time. Feel free to bring it in an we can use the credit towards your new ring(s)!